Why this Luxury Sri Lanka Retreat? Hidden in Sri Lanka’s temperate hinterland there is a village whose glimmering oil lamps and spicy incense lead you to it’s humble door, a place where you return to the innocence and playfulness of childhood. The locals modestly insist that whatever label you give Ulpotha is down to your subjective perspective, that it wasn’t established to be anything other than a simple, self-sustaining community in tune with nature. This luxurious haven is in fact regarded as one of, if not the finest eco-friendly yoga retreat in the world. By some divine design, the founders came across this holy land and breathed new life into it’s uninhabited foundations and thank the lord they did because it alone is reason enough to visit Sri Lanka. 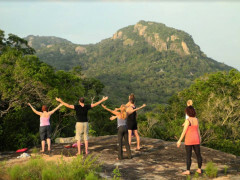 Authentic Sri Lankan Ayurvedic retreat. The village Ayurvedic doctor practices natural medicine based on an ancient practice known as the ‘science of life’. It's a world away from the generic wellness spas of most resorts. He would be a fixture for the locals, as his ancestors have been, whether you’re there or not. The personalised consultations, administration of natural medicine and inclusion of organic food from Ulpotha’s gardens promise to restore you. Calling all you highly strung workaholics and eco-warriors alike, Ulpotha only welcomes guests for half of the year, reverting to its role as a traditional rice growing village for the other half, so don’t miss the boat to the Pearl of the Indian Ocean. 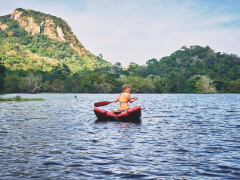 Restore balance and peace to mind and body in the Sri Lankan jungle. Possibly the happiest people on the whole island!